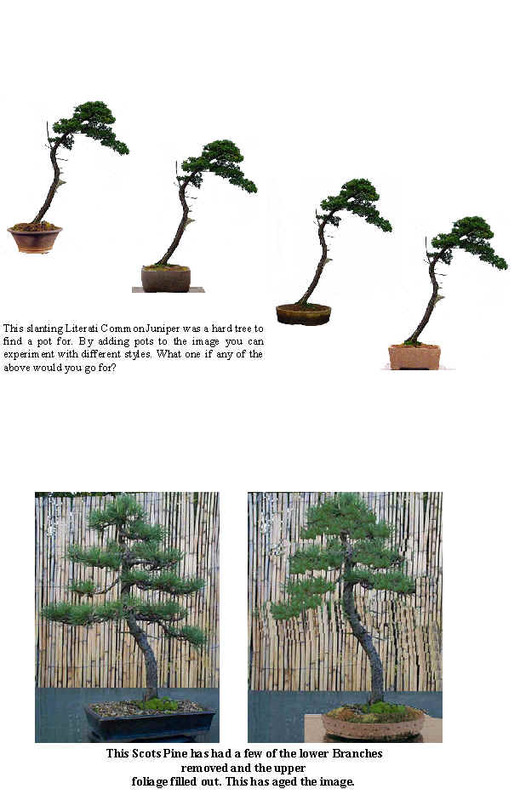 Virtual Bonsai is fancy title for changing or creating bonsai images with computer software. This article will hopefully help the uninitiated get involved with this wonderful way of making decisions with your bonsai without having to lift a pair of Branch Cutters. Dan Barton was one of the first to start using computer software for projecting his ideas for a trees future. 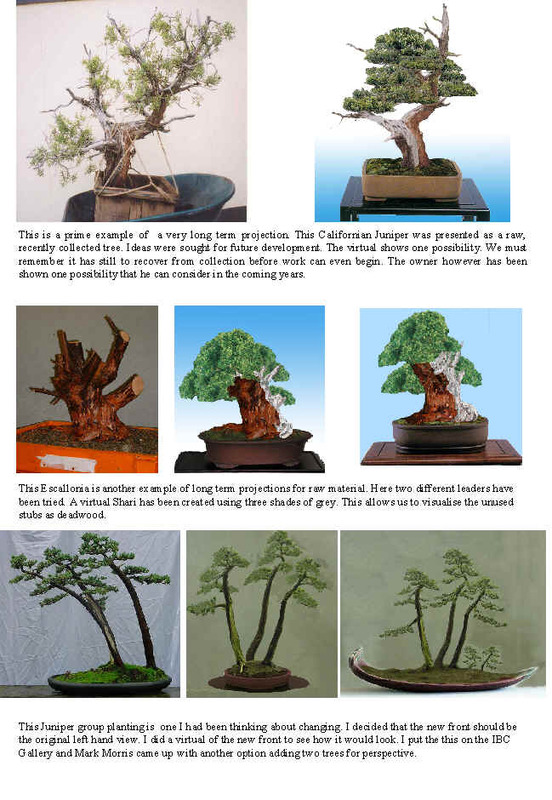 Several articles were published in the UK Bonsai Magazine. (Issues 43 –45.) My own introduction to virtuals was on the Internet Bonsai Club Gallery in 2000. I was amazed with the virtual results created from some of the trees I posted to Gallery. 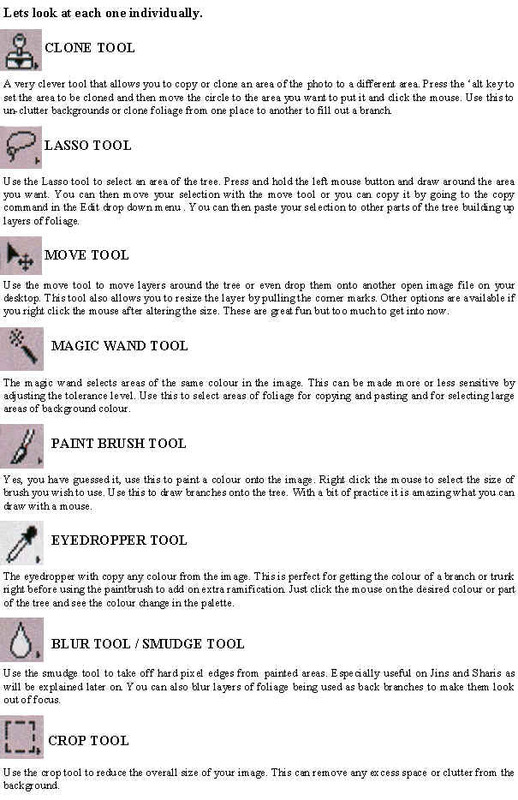 I was instantly hooked and set out to learn how to master this very helpful tool. The most obvious requirement is a computer. Nothing too fancy though, most home computers are quite adequate. Any computer currently on the market will more than suffice. 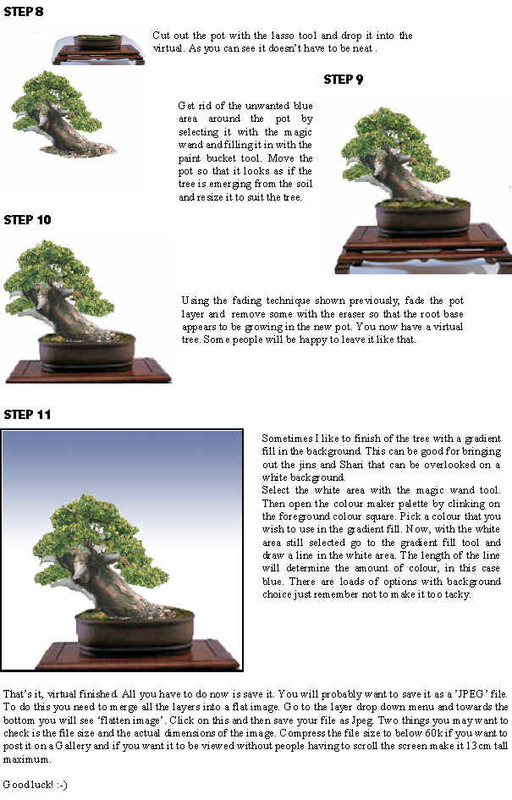 Now you need the software programme that will allow you to alter the Bonsai images. There are lots of these on the market. 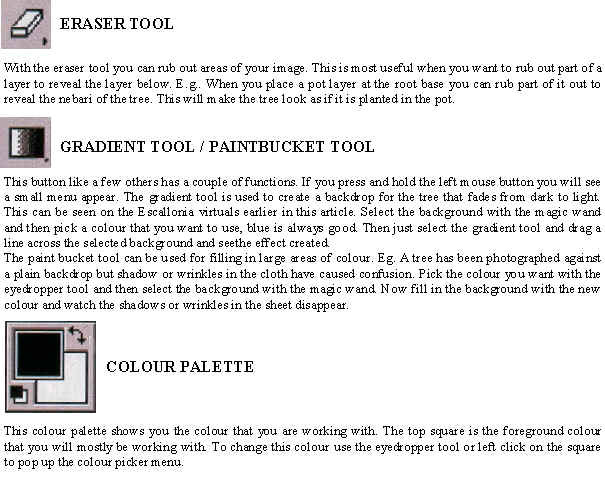 Most PC’s come with Microsoft Paint, which is a basic programme and will do most things you require it to do and the beauty of it is that you probably already have it. I personally use Adobe Photoshop or Photoshop Elements a smaller and cheaper version without some of the frills. Photoshop is a proven leader in the field and will do everything you need, but don’t take my word for it, try a few programmes out. You will find lots of free demo versions with computer magazines. When you find one you like, stick with it. Getting the bonsai into the computer? A scanner is a great way to get your hard copy photograph into the computer. I personally scan all my Bonsai Photos and keep them on Disk for future use. 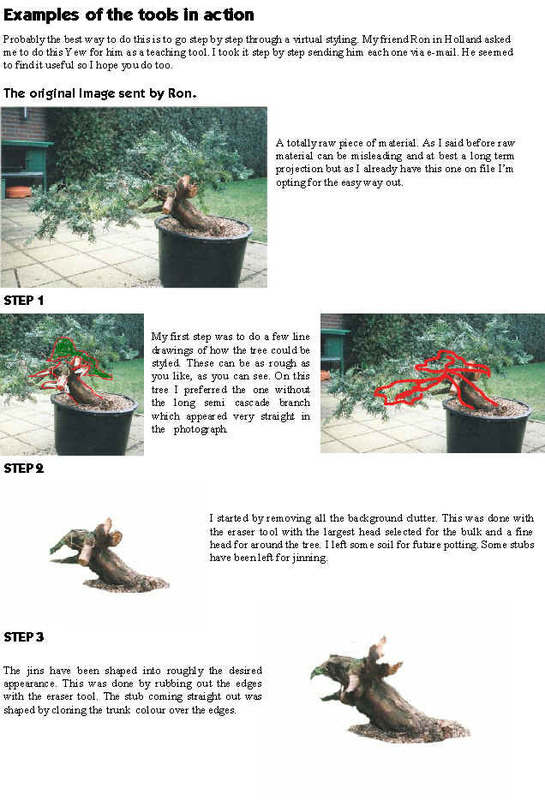 A digital Camera is the quickest and easiest way to get a bonsai image into the computer. It is an expensive outlay but you will save on getting all those unwanted photos developed. The main benefit is that you can snap the tree in the garden and then pop it straight into the computer and work on it. No waiting for the photos to come back from the Chemist. 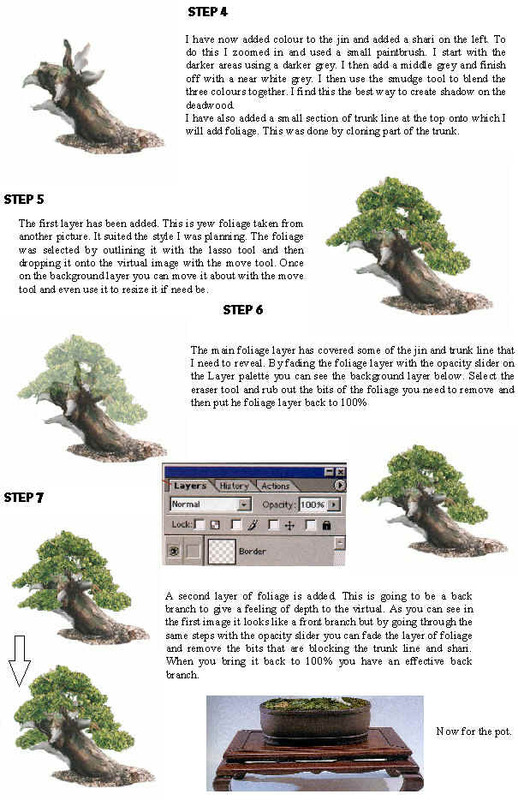 Another way to get bonsai photos to play with is to download them from a website or Gallery. These won’t be your trees but you will learn the same lessons as you would with your own. Why not go to the IBC Gallery and get some photos. When you have played with them you can put them back on the Gallery and see what everyone thinks. A great learning experience. 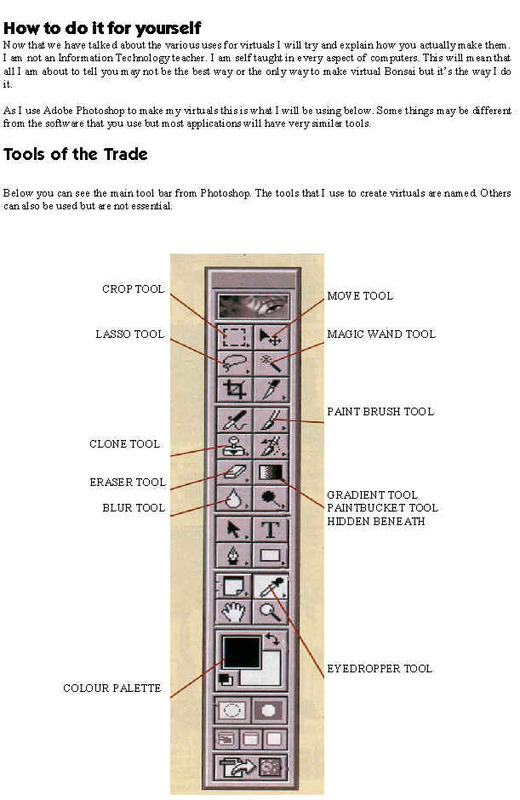 The following are the main ways you can use computer software to assist with the decision making and styling of Bonsai. We all have trees with which we struggle to find a perfect pot. You think you have the right one but a year later you are looking for a replacement. Now you can put your tree into as many pots as you like and compare them before making a decision on which pot to buy. You can also share the images with others to see if they agree with your choice, they rarely do!